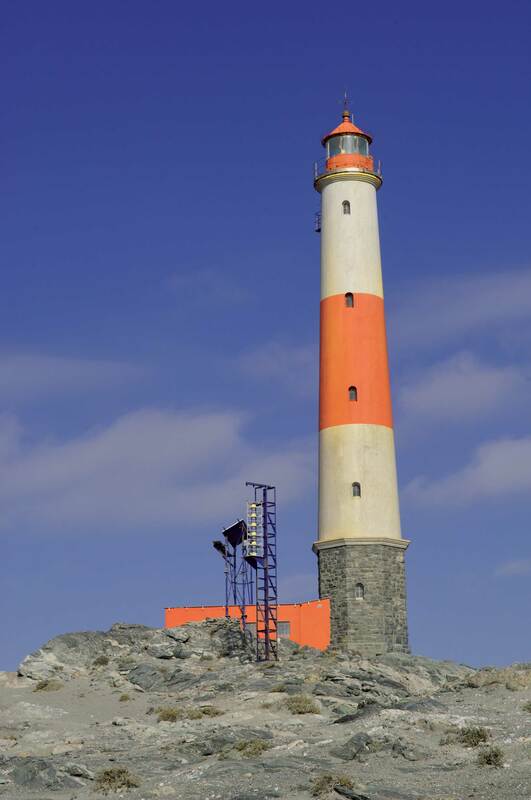 One of Namibia’s truly unique destinations is the coastal town of Lüderitz in the so-called Deep South. Originally named Angra Pequena (small bay) by the famous Portuguese explorer Bartholomeu Diaz in 1487, the settlement was renamed Lüderitz in honour of its founder Adolf Lüderitz in 1884. Located directly on the shores of Lüderitz Bay facing the Atlantic Ocean, Lüderitz forms a barrier between the towering coastal dunes of the Namib-Naukluft Park directly to the north, and the unforgiving rocky coastline to the south. The town has a colourful fishing harbour surrounded by early 20th Century German art-nouveau buildings. Lüderitz is especially famous for its delicious fresh seafood: west-coast rock lobster (called crayfish locally), oysters and the much-sought-after delicacy abalone (perlemoen variety). The town celebrates its rich seafood culture by presenting the annual Lüderitz Crayfish Festival. Current developments in the town include the construction of the Diaz Wind Power project at Diaz Point 12 km south of the town. Namibia’s first wind farm is expected to generate wind energy at a capacity of 44 megawatts; construction on the project is expected to start in 2015. A major project for the future is the establishment of the largest maritime museum complex in Africa. This multi-million-Namibia-dollar tourist attraction will display Namibia’s rich maritime history, geology and marine fauna and flora. Cafés, restaurants, an outdoor arena, a yacht jetty and large promenades will provide additional relaxation opportunities for the visitor. The scheduled date for completion of this major maritime centre is 2016. Lüderitz is easily accessible by good roads from Windhoek, Keetmanshoop and the Fish River Canyon, as well with direct Air Namibia flights from Windhoek International Airport several times a week. 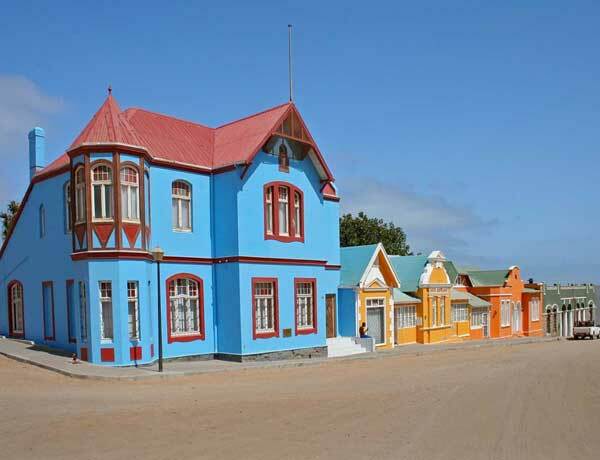 Lüderitz is renowned for its old-world charm and distinctly German-colonial architecture. Set around the bay, the buildings with their gables, winding stairwells, verandas, turrets, bay and bow windows have a unique character all of their own. One of the most striking is Goerkehaus built in 1909 on the slopes of Diamond Mountain. The Felsenkirche (Evangelical Lutheran Church) close by, consecrated in 1912, looks especially striking in the late afternoon when the stained-glass windows are illuminated by the setting sun. This building is truly unique, as all construction materials, including the building sand, were imported from Germany. An important historical landmark indicating the commencement of Namibia’s colonial history is a memorial built in 1903. It originally stood in the old Nautilus cemetery on the site of the first surveyor’s beacon. The memorial was moved, as were the graves of German soldiers, to Shark Island in 1977. Other noteworthy structures are the old Station Building (1914), the old Post Office (1908) and the Turnhalle (1912–1913). In the ‘old town’ are Kreplin House (1909) and Troost House (1909). The Krabbenhöft & Lampe Building (1909) was erected to house a trading business during the period of economic prosperity following the discovery of diamonds. The Deutsche Afrika Bank (1907) is part of the historic street view of Bismarck Street, one of the oldest roads in town. In Berg Street, in the historical core of the town, is a complex of two conjoined buildings (1909), consisting of residences built during the diamond boom. In the same street is a semi-detached house (1909), which blends in architecturally with the rest of the Altstadt area. The Lüderitz Museum was founded as a private collection by Friedrich Eberlanz, who arrived in the settlement in 1914. The focus in the museum is on the early history of the town and aspects of the surrounding desert. 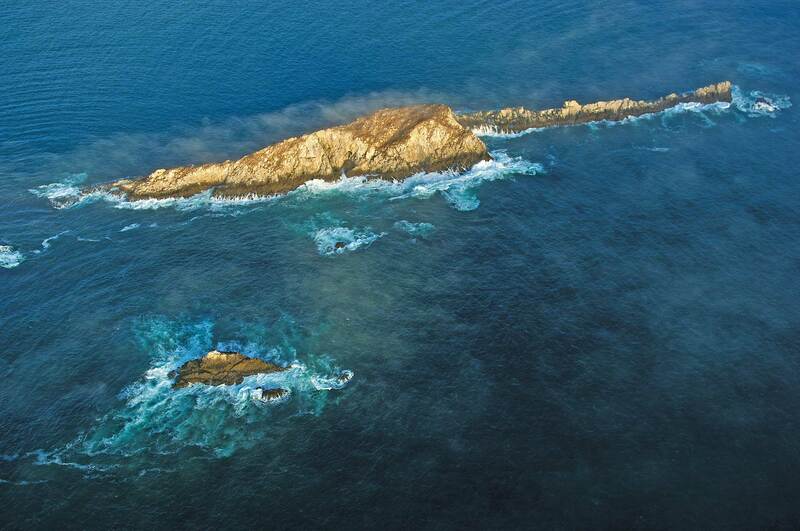 The Lüderitz Peninsula is characterised by numerous bays, lagoons and unspoilt stretches of beach. 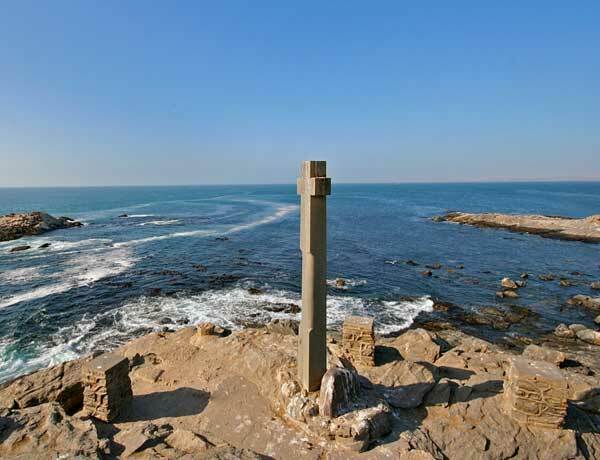 At Diaz Point a replica of Bartolomeu Dias’ padrão can be seen, while a memorial on Shark Island commemorates Captain Cornelius Fredericks. The popular local beaches are Grosse Bucht, Sturmvogelbucht and Agate Beach, the latter with its excellent barbecue facilities, long sandy beach and good bathing opportunities. The remains of an old Norwegian whaling station can be viewed further out. The Lüderitz area is home to a wide variety of aquatic birds. Large numbers of flamingos, cormorants and seagulls inhabit the shallow lagoons. When sailing in the bay, seals and dolphins can be seen playing in the water. For anglers, favoured species are galjoen, steenbras, dassie and rock lobster. It is not unusual to see an occasional jackal or brown hyaena trotting along the beach, or a group of springbok close to the sea. An attractive plant in the surroundings is Bushman’s candle, its pink flowers contrasting vividly against the black rock. Unusual species of dwarf succulents grow in the area, such as small but intriguing lithops, colloquially referred to as Hottentot’s buttocks. Daily catamaran tours from Lüderitz take visitors to view Namibia’s second largest colony of African Penguins on Halifax Island. If Lady Luck is with you, you might also be treated to a Heaviside’s dolphin swimming alongside or in front of the bow of your boat, and even a whale or two, which visit the bays on a seasonal basis. Popular windsurfing areas are Grosse Bucht and Grosse Lagune. Usually held in October/November, the Lüderitz Speed Challenge is an annual five-to-six-week event that features the world’s best kite surfers and windsurfers competing for the top world ranking in speed sailing. Since 2007, 90 national and 14 world-speed sailing records have been broken, with the event attracting leading international windsurf and kite surf champions from abroad. See www.luderitz-speed.com for a full report on the 2014 Lüderitz Speed Challenge. A Snoek Derby normally takes place during the long weekend in May; and in September, the Lüderitz Karneval, is held according to German traditions. The annual Crayfish Festival during April/May is another sought-after event. For golfers there is an interesting desert course, described by locals as ‘a 4×4, rough-and-tough golf course’ and ‘rocky with oiled greens’. Desert adventure activities offered include 4×4 guided and self-drive tours into the vast Namib-Naukluft Park to the north, and the Tsau//Khaeb National Park (the former Sperrgebiet National Park) to the south. Excursions in the Lüderitz environs vary from 4×4 full-day or overnight camping tours to experience the high desert dunes, vast open plains, black mountains, unique flora, desert wildlife, and magnificent desert night skies, and to view a host of bird life, which includes travelling past a protected Damara tern breeding ground. Marine tours cruise around Lüderitz Bay and outlying islands such as Diaz Point and Halifax Island – the latter featuring Namibia’s largest African penguin colony – and viewing Grossebucht (Big Bay), Eberlanz Cave, and viewing a colony of Cape fur seals, an abandoned whaling station, WWI battlements, an old fog horn and lighthouse, not to mention catching a glimpse of a Heaviside’s dolphin. At the end of an action-packed day, guests are treated to freshly caught oysters. Oyster and abalone production in Lüderitz is on the increase, with marine aquaculture enterprises currently producing abalone, oysters, mussels and seaweed in the Lüderitz sea lagoons and the salt-pond of Walvis Bay and Swakopmund. There is a wide choice of options for savouring seafood in the coastal resort. The Lüderitz Nest Hotel has two restaurants – the new Crayfish Bar & Lounge and the Penguin Restaurant – while other places to enjoy seafood, although not open seven days a week or on Sundays and public holidays – include the Oyster Bar on the way to Shark Island, and Ritzi’s Restaurant on the Waterfront. The Shearwater Oyster Factory and Bar is open for the public on an ad hoc basis. The Lüderitz Waterfront Development comprises flats, restaurants, sections for small and medium enterprises, and office space for rent. The second phase of the N$230-million Waterfront Project is scheduled for completion by April 2016. The old power-station building, located directly on Lüderitz Bay, will be converted into Africa’s largest Maritime Museum and a modern satellite campus for the Polytechnic of Namibia. The development will also include a restaurant, cafés, outdoor terraces and a marina. The Yacht Club is also at the Waterfront. On the other side of Hafen Street is Market Square, a second complex designed in the same style and colours, and consisting of eight shops, five offices and nine flats, forming a link to the centre of town. The town’s heritage railway station building and platform has recently enjoyed upgrades. The first train arrived at the revamped Lüderitz railway station in November 2014. The upgrading of the Aus-Lüderitz railway, scheduled for completion by January 2015, involves the rehabilitation of 138 km of railway tracks. 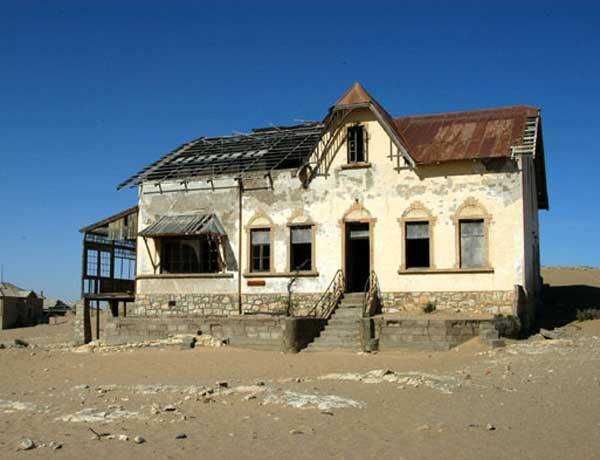 Namibia’s most famous ghost town, Kolmanskop, is situated in the Tsau//Khaeb Park (former Sperrgebiet National Park) about 10 km inland from Lüderitz. It was named after transport driver Johnny Coleman, who lived in the tiny settlement of Aus at the turn of the century. 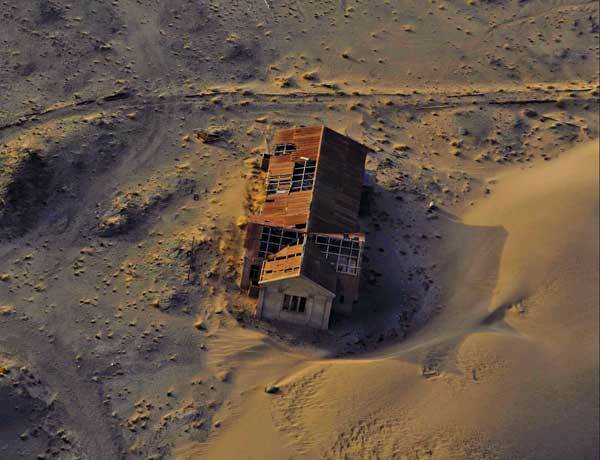 During a fierce sandstorm he was forced to abandon his ox wagon on the small incline from where Kolmanskop can be seen. It stood there for a while, giving rise to the name Colemanshuegel, which eventually became Kolmanskop. 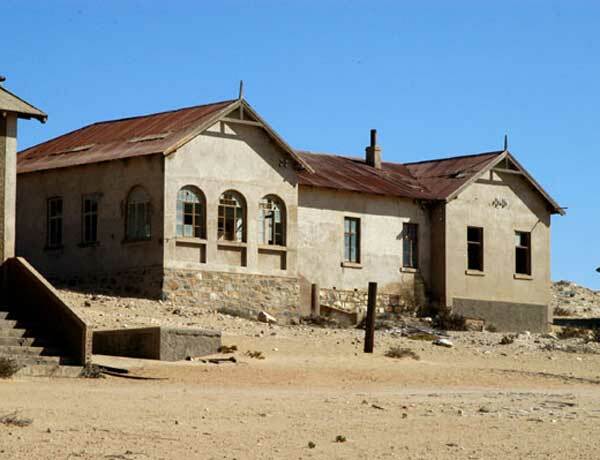 In 1908 the railway worker Zacharias Lewala found a sparkling stone in the sand he was shovelling at Kratzplatz railway station nearby Kolmanskop. His supervisor, August Stauch, was convinced he had found a diamond. When this was confirmed, the news spread like wildfire, sparking a frantic diamond rush and causing fortune hunters to converge on Kolmanskop in droves. It soon became a bustling little centre, featuring a butchery, bakery, furniture factory, soda-water and lemonade plant, four-skittle alley, public playground and even a large salt-water swimming pool. By 1915, Kolmanskuppe was one of the richest towns in the world with its own millionaire’s row, large outdoor salt-water swimming pool, bowling alley, hospital, entertainment hall and ice-making factory. The first X-ray machine in the southern hemisphere was introduced here, as well as the first tram in Africa. Today, Namibia’s diamond-mining operations take place offshore in the Oranjemund area (on the border with South Africa). The development of the town reached its pinnacle in the 1920s, with approximately 300 German adults, 40 of their children and 800 Owambo contract workers living there. In spite of, or probably because of, the isolation and bleakness of the surrounding desert, Kolmanskop developed into a lively little haven of German culture, providing entertainment and recreation to suit the requirements of the affluent, for whom large, elegant houses were built. The well-equipped hospital at Kolmanskop boasted Southern Africa’s first X-ray machine. However, when richer diamond deposits were discovered further south, operations were moved to Oranjemund. Today the crumbling ruins of the ghost town bear little resemblance to its former glory. The stately homes, their grandeur now scoured and demolished by desert winds, are gradually becoming enveloped by sand. In 1980 the mining company CDM (now Namdeb) restored a number of the buildings and established a museum for tourist viewing. Permits are needed to enter Kolmanskop. These can be obtained at the entrance gate, which is open daily from 08:00 to 13:00 (longer for visitors who have a photo permit. Interesting guided tours are conducted free of charge, in English and German, from Mondays to Saturdays at 09:30 and 11:00, and on Sundays and public holidays at 10:00. Tourists are increasingly succumbing to the original and wild Lüderitz appeal. One of Namibia’s leading resort hotels, the four-star Lüderitz Nest Hotel is the perfect base from which to explore the coastal town, or to simply spend a few days relaxing. Guests at this award-winning hotel will be happy with enhanced free Wi-Fi, upgraded rooms with the latest flat-screen HD TV, award-winning chef in charge of the locally acclaimed Penguin Restaurant and mountain-bike rentals at the disposal of energetic visitors. Probably the biggest treat of all is the hotel’s new Crayfish Bar and Lounge, with its splendid sea views, offering fresh Lüderitz oysters and cocktail sundowners.